This fantastic 1-Bed Apartment is one of a kind, boasting the most amazing roof terrace overlooking London. With views stretching for miles, experiencing London to the fullest could not be easier. 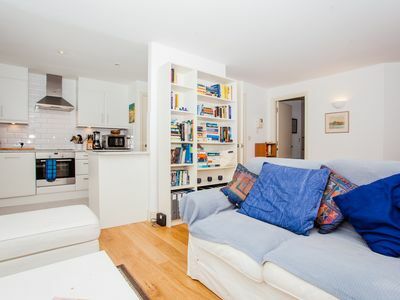 The flat has a plush living area alongside a modern and fully-equipped kitchen. This spacious and contemporary apartment could not be better located. Two minutes walk from the tube station. Minutes away from hotspots like Brick Lane, Spitafields and Shoreditch, and a short ride into the City. The apartment has one double bed, a bathroom and fully-equipped kitchen. The apartment has a homely and warm atmosphere and provides the perfect home from home for those visiting London. Guests will find plenty of space and the natural light enhances the peaceful and calm atmosphere. Our cleaners place fresh, hotel quality linen on the bed just before your arrival.